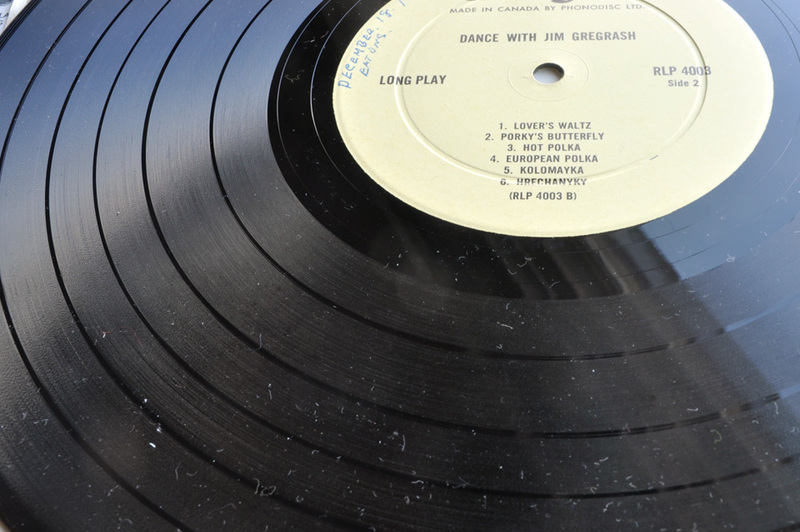 Dance With Jim Gregrash. Regis Records. RLP-4003. From The Regis Library of Folk Music. Manufactured and distributed in Canada by Phonodisc Ltd in Toronto. 1950s. I am establishing the date based upon a handwritten date on the album itself. 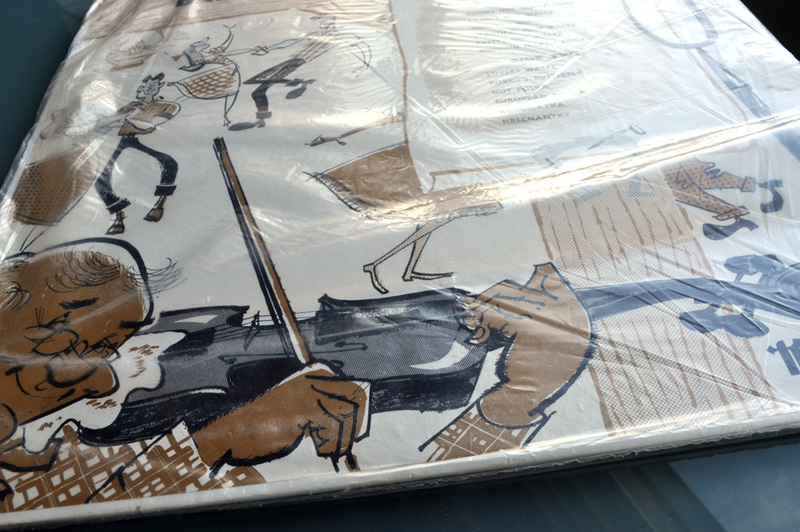 The back of the record has images of 5 other polka/dance albums. They all have the same illustration, all that changes is the inset of the list of songs. Artwork didn’t come cheap back then. The songs are mainly waltzes and polkas. A search reveals this to be Ukrainian music. Other than the dust I don’t think this record is in such bad shape. And, there’s someone out there who has this on their wish list. This could be the first B to B Obso sale. But I won’t set my hopes too high. Jim Gregrash was apparently a legendary fiddler, so I think this is a toe tapper. 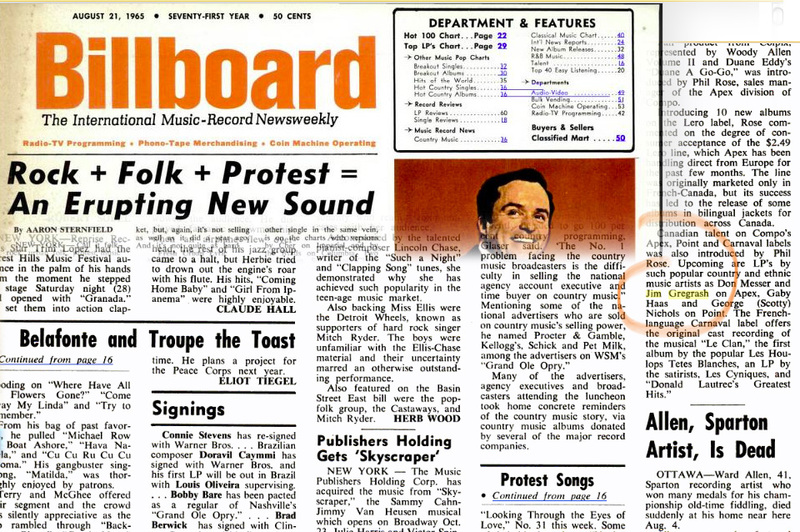 Jim Gregrash mentioned in August 21, 1965 Billboard Newsweekly. Then in its 71st year at a cost of 50 cents. Status: Hopefully sell. If not, use the Hot Polka tune as background music for a 33 1/3 second film of various feet tapping in time. Alt-title: Untitled Object No. 358 For Keeping Old Time. Kung Hei Fat Choi! Gung Hay Fat Choy! 恭禧發財! Happy New Year! Another chance to start afresh. I lightly dusted yesterday, forgetting the New Year was upon us, and it’s supposed to be bad luck to clean today, so the remaining dust will prosper for another day. It’s ok, as I’m rather fond of dust. I have tons of albums, but no record player and no Jim Gregrash albums. I collect vinyl, and I’ve never seen a release on Regis Records. In general, Canadian LP’s seem to be surprisingly rare down here. Maybe they’re all in thrift shops in Minnesota. Do you? Cool. I know, g00gling turned up few results. Some things are not digitized, which pleases me. 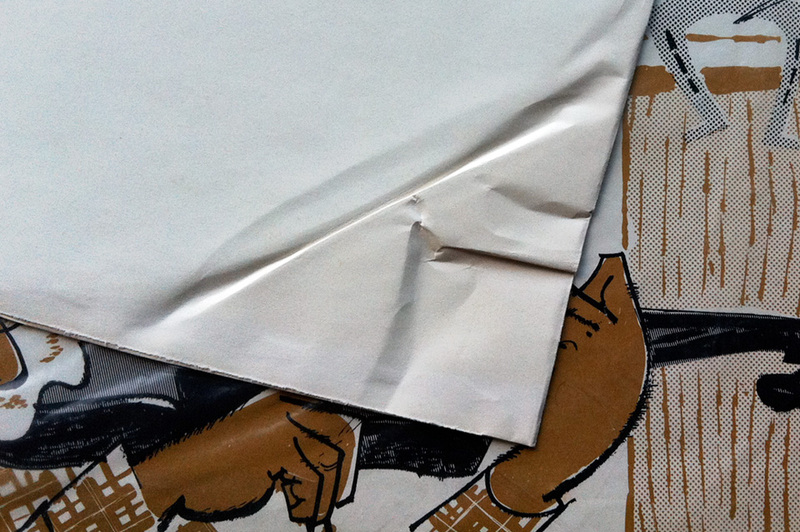 I don’t think I’d unload any Canadian LP’s, or anything that’s out of print. 🙂 Too late – we let go of a rubbermaid box full of LPs a couple of years ago to a gal who had a cottage. At least we felt they were going to be played. That was before the record player with the USB came into the house. We didn’t have a record player for ages. Happy New Year, Deanne! Love that final shot. Thanks Richard – on both counts.